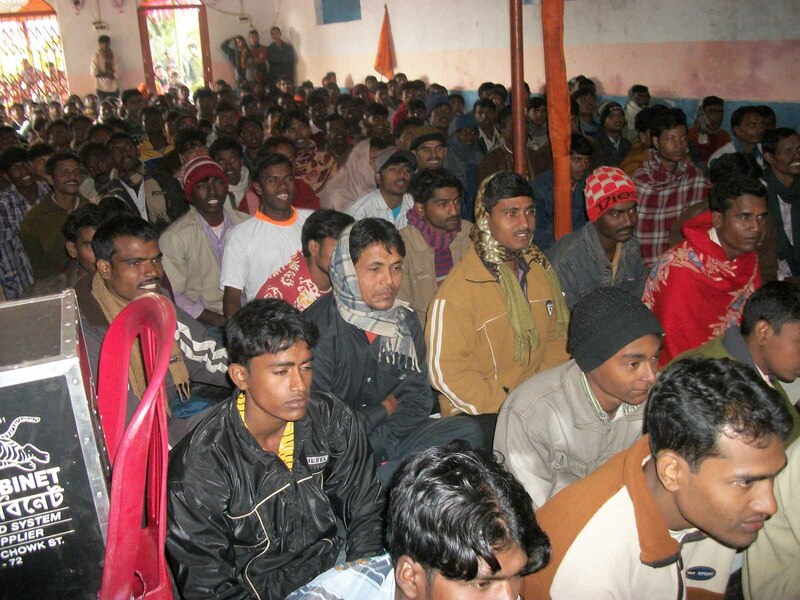 Kolkata, (December 26th, 2011) – Shri Dilip Mehta, the President of Hindu Mahasabha of America, addressed a huge assembly of Hindu Samhati activists and workers in Canning, a suburb of Kolkata. He was greeted with the cries of “Jai Shri Ram” by the crowd, to which he quipped that Hindus should make use of the power of divine femininity, and exhorted them to change their slogan to “Durga Mata Ki Jai.” The entire assembly rose up on its feet to his exhortation by a thunderous battle-cry of “Durga Mata Ki Jai.” Shri Mehta told the assembly that the concepts of absolute and one-way Satya and Ahimsa, without appropriate visible deterrents at all levels, are causing great damage to the present-day Hindu society, and that in the ancient Hindu traditions all Rishis, obviously wedded to the principles of Satya and Ahimsa as part of the Dharma, were protected by weapons in their ashramas. It is the law of the nature that a bully will always go for the weak, hence we must do everything to be strong in all possible ways so that a bully does not feel encouraged. He added that Bhagwan Rama did not go on a hunger-strike in front of Ravana’s Palace, to get his Sita back. He trained and organized and strategized even as he remained true to Dharma to meet the challenge. Hence, a change in Hindu attitude is the need of the hour. In his address to the assembly, Shri Dilip Mehta outlined the current political situation in the country, and highlighted the fact that Hindus do not have a political voice in India. When Dr. Manmohan Singh had proclaimed that Minorities in India had the first claim on country’s resources, there was no opposition to his views in the Parliament. The principal opposition party had become hostage to the compulsions of coalition politics, leaving the Hindu majority without a political voice. Hence, all Hindu political activists must work hard to send a minimum of a dozen MPs to Lok Sabha under an explicit Hindu banner. This banner could be that of Akhil Bharat Hindu Mahasabha. There are two years left to the next Lok Sabha, and all Hindu political forces must coalesce to open the Hindu political account in the country’s parliament, so that whenever the next secularist Prime Minister goes out of his or her way to appease the minorities, at least a viable political Hindu protest could be registered in the Lok Sabha. 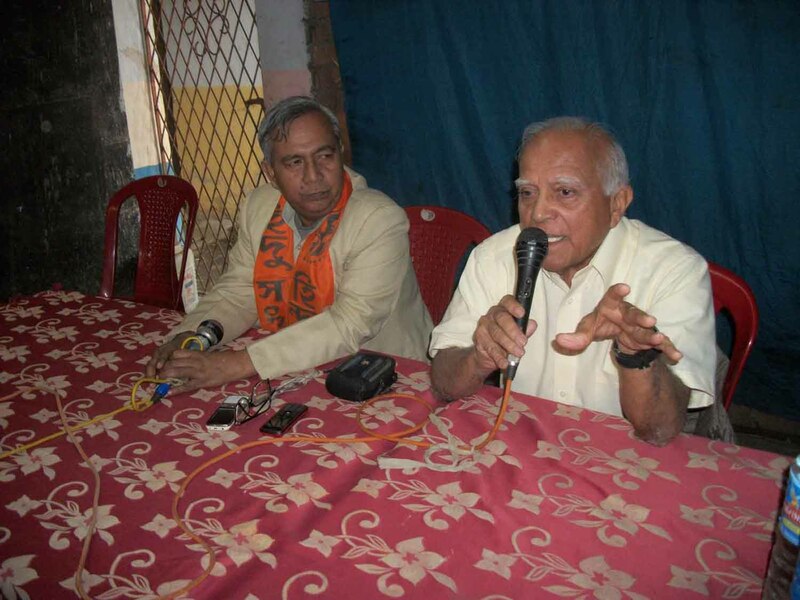 Further elaborating the political future of the Hindus in India, Shri Mehta said that the demographic situation in West Bengal, Assam and rest of Eastern India is getting worse by the day, and anti-national forces may cause another partition in the next 10 to 20 years. He added that doing social work alone is not enough, as political power is necessary for basic protection. Hence, all Hindu political forces need to unite towards a single purpose of attaining Hindu political power. Shri Mehta visited and consoled several Hindu girls who were rescued by Hindu activists from the homes of Muslim goondas, where they were being kept against their will and raped daily by their abductors. Shri Mehta expressed shock at the insensitivity and helplessness of the local police in maintaining basic law and order, and compared the situation to Noakhali in 1947.